The 20cm x 3.0mm Outer Tube is a flexible tube manufactured from the same material as the other tubes in the Hemingways range. The tubes have been tested down to sub-zero temperatures to ensure that they will not crack or break when cold. The inner diameter of the 3.0mm tube is manufactured to be compatible with the 1.8mm Hemingways Inner Tube. 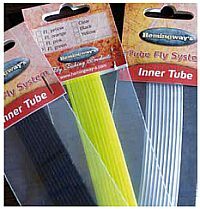 The 20cm x 1.8mm Inner Tube is a flexible tube manufactured from the same material as the other tubes in the Hemingways range. The tubes have been tested down to sub-zero temperatures to ensure that they will not crack or break when cold. 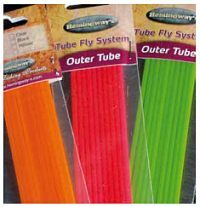 The outside diameter of the 1.8mm tube is manufactured to be compatible with the 3.0mm Hemingways Outer Tube for standard tube flies or can be used on its own for smaller tube fly patterns. This Soft PVC has been designed to fit on to the Brass US tubing, Outer and Inner Hemingways tube and also to use with free swimming hooks. It can also be used with the bottle tubes to add a focal point. Replacement Flying C Tubing can be purchased for any of your Tubeology systems or as add-ons to an existing system. Or Flying C Tubing can be cut to any length to create any length Flying C's that you like. Suppied in 60cm lengths in either red, black or yellow.  Eumer plastic tubes are made of a fluorescent, elastic and durable material suitable for all types of tube flies. 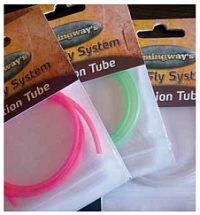  Because of the bright colors, it is possible to tie striking flies directly onto the tube.  Nine different colors of plastic tubes are available in 2-4 different sizes (x-small/small/medium/large), made so that a smaller size can be snugly fitted together with an appropriate larger size.  Eumer plastic tubes are compatible with all Eumer brass tubes and coneheads.  A packet consists of 1 m of Eumer plastic tubing (single color) and the multiple color packets contain 9-18 m of an assortment of various inner and outer tubes.